There is no doubt that Stirling Crauford Moss was the greatest driver never to win the World Championship.Where his friend, mentor and arch-rival Juan-Manuel Fangio excelled in Grand Prix racing, Moss was a brilliantly versatile all-rounder who could perform as well in grueling sportscar events such as Le Mans, the Targa Florio or the Tourist Trophy as he did in Formula One. His dramatic victory for Mercedes-Benz in the 1955 Mille Miglia endurance race across Italy owed much to detailed route planning, but his innate ability was the predominant factor.Moss's father Alfred, a dentist, had dabbled with racing, and his son began to follow suit in 1947. He made his name in the tough Formula 500 (the forerunner of F3), before winning the Tourist Trophy in 1950 in a private Jaguar XK120. After that he was asked to handle a variety of cars, and his strong sense of patriotism kept him largely in British machinery. 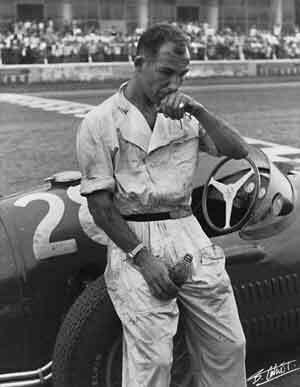 It was not until 1954 that he bit the bullet and purchased a Maserati 250F to try to progress his F1 career. That led to an invitation to join the Mercedes-Benz works team alongside Fangio, and thereafter to leadership of Tony Vandervell's Vanwall team. In the latter, Moss was instrumental in breaking the German/Italian stranglehold on F1. Later would come further triumphs in Cooper and Lotus machinery, for privateer Rob Walker.For Moss the manner in which the battle was fought was as important as the outcome, and this sporting attitude cost him the 1958 World Championship when he stood up for rival Mike Hawthorn, who faced a penalty in Portugal that would, in retrospect, have denied him the points that he needed to beat Moss. Stirling never for one moment entertained any thought of gaining an advantage in such a way, and in any case his natural sense of justice would not have allowed him to see Hawthorn unjustly penalized. So he stepped forward to defend him. Hawthorn subsequently went on to beat Moss by a mere point, even though he had only won one race that year to Moss's four. It was sufficient to make Mike Hawthorn Britain's first World Champion.Moss's active career in top line competition ended when his Lotus left the road at Goodwood at Easter 1962, and he received serious head in juries. That left a twofold postscript to a fabulous career. What might he have achieved had he not stuck so religiously to driving British cars, or if he had accepted more offers of full factory drives instead of sticking so resolutely with Walker?And what might the future have held had he not felt obliged to rush his recovery, and been discouraged when his initial trials made him doubt that the old flair was intact?